A tricked out case is the nerd equivalent of a pimped out car. Naturally you want it to look good. It should also make some kind of statement about you, other than “I’m overcompensating.” We first saw this case when we were in Las Vegas for CES 2010. I was instantly taken by the looks of it. 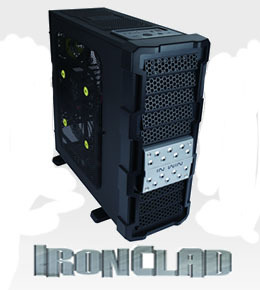 When I found out that In Win was going to send us their Ironclad case, I jumped at the chance to review it and see if my initial excitement was convention over-excitement or something real. I’m not usually one to buy into marketing hype, but it does look like it’s ready for war. Based on the pictures included in this review I am not too highly impressed with cable management. In fact there appears to be little or none. The top fan and rear fan sizes should be bigger especially if you wish to use an extended ATX motherboard. Other than that it looks like a fine case but I wish companies like this would beta test preliminary models and get feedback from users about what they want and need.